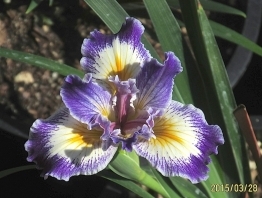 This is a pacific coast iris that is – an older Ghio variety. If you want large impressive flowers for a shady area take a look at these. They flower from late winer through spring and are evergreen the rest of the year. Flowers are approximately 4-1/2″ across. These are best planted in fall through early spring. Fairly drought tolerant after established – the ones planted out at the nursery aren’t watered in summer.